Photo: Bakhrom Khamroev at the picket in support of victims of "the Nookat events". Moscow. October 20, 2009. Video of picket is available here. The leading global news agencies informed about this incident. On the night of November 18 Human Rights Watch demanded the immediate release of detained leaders from the government of Kyrgyzstan. Many international human rights organizations have been concerned about the issue. The official government of Kyrgyzstan still gives no comments. Here goes the story of Bakhrom Khamroev, written after his return to Moscow. 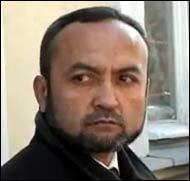 In the city of Osh on the evening of 18 November 2009, a member of Memorial Human Rights Center, Bakhrom Khamroev, was illegally detained by representatives of the State Service for National Security (GSNB). Khamroev was collecting information on persecution of independent Muslims in Southern Kyrgyzstan. Without any kind of reason, the Russian citizen was held in detention for about 14 hours, subjected to interrogations and scare-tactics, before being put on a plane to Moscow on the morning of the following day. Global information agencies reported on the incident. On the evening of 18 November, the organization Human Rights Watch urged the authorities in Kyrgyzstan to immediately free the detained (a local human rights defender, Izzatilla Rakhmatalliev, was held alongside Khamroev for some hours), and not to hinder their further work. Many international human rights organizations expressed concern at the events. Official authorities in Kyrgyzstan are still refusing to give any comment. Many important details from what transpired have been unknown up until now. The following are the most important episodes according to Bakhrom Khamroev himself, and were put into writing after his return to Moscow. It is worth noting that while writing down the incidents, our colleague has still not completely recovered from the stress that his stay with GSNB caused. A great number of GSNB representatives spoke with him, almost none presented themselves by name and rank. In violation of norms and laws regulating arrests, the confiscation of money and personal belongings as well as the deportation were not documented, and demands to meet with a Russian consular officer and that a formal protocol be held were ignored without any explanation. The surveillance of the human rights defender began on 11 November – almost immediately upon his arrival to Osh. On 13 November Bakhrom arrived to the town of Nookat together with a local human rights defender, Izzatilla Rakhmatalliev. While meeting in a café with relatives of a persecuted Muslim, representatives of GSNB told Rakhmatillaev and the owner of the café that Bakhrom should leave the region, and called him an “English spy”. As a result, he had to cancel the other planned meetings and return to Osh. On the morning of 17 November, the administrator at Hotel Navruz in Jalalabad gave Bakhrom a verbal warning from GSNB : Leave the city within 2 hours or he would “meet with a surprise”. On the advice of local human rights defenders, he left Jalalabad for Osh. On the evening of 18 November Bakhrom was eating dinner with a journalist from Radio Free Europe/Radio Liberty, Sherzod Jusupov in Issyk-Kul Café in downtown Osh. The GSNB representatives who were carrying out the surveillance entered the café briefly during the dinner. Soon it became clear that their visit was part of the preparation to arrest the human rights defender. Approximately at 6.10 PM, Bakhrom and Sherzod left the café. They had only walked about 10 meters when they were unexpectedly stopped by two police officers on the pretext of a documents check. Sherzod was taken to the City police station (GOVD), and released after about half an hour. The other police officer checked Bakhrom’s passport and gave it back, saying “Everything’s in order.” As soon as the police officer stepped away, Bakhrom was immediately surrounded by a number of people in civilian clothing and took him by the arms. On the human rights defender’s request, one of them showed an ID-card for the GSNB. Bakhrom was not allowed to call anyone, his mobile telephone and the bag with his camera was taken from him with the words “Maybe you have explosives in the bag”. He was forced into a car and taken to the GSNB building. Another car with local GSNB officers followed them to the building. The car with the detained drove into the gates of the GSNB building. Bakhrom was taken inside, with his head forcefully held down with the words “The building is a secret object, you are not allowed to see it”, and then taken to an office on the first floor. His belt, tie and money (about 450 USD) were taken from him, his pockets were emptied, and a camera and three notebooks with notes were taken from the bag and brought to the commander. One of the officers who arrested him called somewhere on his mobile phone and said, “All right, we brought him in, come, come”. Bakhrom demanded that the Russian consular officer be called in and that an official protocol be kept, but he was told that he would not need neither the consular officer or a protocol, as security service officers from Andizhan were on their way to Osh, and that he would be handed over to them. “They’ll come now and put you up against the wall”. They started asking, “Why are you wanted by Uzbekistan? They are very interested in getting hold of you.” Through the window, Bakhrom was shown two cars that, according to the GSNB officers, had come for him from Uzbekistan. On one of them one could clearly see Uzbek number plates. In the corridor he also saw several Uzbeks, none of them spoke to him. It is hard to say whether these threats were simply a way of exerting psychological pressure, or whether the question of extradition of the Russian human rights defender to Uzbekistan actually was discussed between the leadership of the security services of the two countries. We don’t exclude that Bakhrom was saved from extradition only by the fact that the information about his arrest reached foreign media outlets that same evening. In the office where Bakhrom was being interrogated, no less than three GSNB officers were continuously present. They demanded that he write an explanation, that he give short biographical details, the reason for his visit, where he stayed in Osh, details about relatives in Uzbekistan. Bakhrom’s answer, that he came to Osh to meet with relatives of refugees and families of imprisoned persons were not to the liking of the security services, they demanded several times that he re-write his explanation. Some of the questions were reminiscent of a parody of spy movies : “Do you read namaz? Who sent you? What task were you fulfilling? Admit it, you came here to organize an uprising, a coup. We know everything about you. Why did you organize a demonstration outside Kyrgyzstan’s Embassy in Moscow? Why do you have the telephone number of a GSNB officer in your notebook? * Were you planning to murder him? And why did you write that they beat up this guy, they planted flyers on that guy? Are you trying to destabilize the situation? Who heads Memorial? Orlov? How old is Orlov? Do you work with Ponomarev? Yes, he’s a “well-known personality”. Who finances your organization? If you don’t admit it, we’ll bring those who fought with the rebels, they are BESPOSHADNYE. We’ll put you in cell number 4, then you’ll see…” Some of these questions were repeated several times. After about an hour they found out where Bakhrom’s bag with his things was, and sent a group there that returned around 8 PM with the bag and the man who lived in the house, the human rights defender Izzatilla Rakhmatillaev. About 700 pages of documents were taken from the bag : copies of court documents related to criminal cases involving Muslims, expert evaluations of religious literature and other items, such as a DVD, the Memorial publication with lists of political and religious prisoners in Uzbekistan and 2 copies of the report on the Nookat events, as well as 4 local flyers from Hizb-ut-Tahrir (one in Kyrgyz and three in Uzbek language). Bakhrom did not deny that all that had been confiscated belonged to him. This great amount of papers caused a noticeable stir among the security officers. “How did you manage to collect this much material in a few days?” they asked the human rights defender. A young Kyrgyz expert who glanced through the stack of court documents and other documents, exclaimed dogmatically, “The crime is totally evident. There is secret information here. We’ll open a case.” He asked Bakhrom, “Why did you collect these documents?”. His answer, “For monitoring of oppression”, caused laughter among the GSNB officers, “What repression are you talking about? Our government is the most democratic, you know”. Other findings were given the same kind of one-sided interpretation. After some time, the head of one of the sub-departments of GSNB met with Bakhrom. All the other officers left the office. Bakhrom was given a choice : Wither they would hand him over to Uzbekistan, open a criminal case for extremism or hw would “apologize to the leadership of GSNB” and “voluntarily” travel home. Then he was again asked questions : Admit it like a man, who are you – a spy, are you spying under the cover of doing human rights monitoring; who sent you? Why did you collect the information? Why did you come to Kyrgyzstan and not to Uzbekistan? Which extremists did you meet with? (Bakhrom declined to answer this question). “The guys will work with you now, you will do everything they say.” “We’ll see”. “What does that mean, we’ll see? Look how you’re talking. Watch it, we’ll send you to the cell number 4”. Around the middle of the second night, Bakhrom, who was in a stressed situation, agreed to follow GSNB’s demands and wrote a short ‘apology’ : that he hadn’t spread the 4 flyers from Hizb-ut-Tahrir they had confiscated , that he hadn’t even had time to read them, that he would not break the law; and if it was illegal to keep such papers, he asked Kyrgyz authorities to forgive him for this. After this he was left alone for a while. Around 4 AM Bakhrom was brought to the airport, which turned out to be closed. They went to a café, then back to GSNB. The officers were tired and as a joke suggested to sell the human rights defender to Uzbekistan and then go home each to their own. Such dialogues went on until boarding of the airplane around 8 AM. The human rights defender was not returned his money (they said that everything had been spent on his return ticket, which he himself never saw). GSNB also kept his mobile phone with SIM-cards from Moscow and Kyrgyzstan, all papers and “dangerous” notes and the memory stick to his digital camera with hundreds of photographs mostly with family pictures. The incident with Bakhrom Khamroev once again turns our attention to the situation regarding the increasingly serious and widespread violations of civil rights that are carried out by Kyrgyzstan’s special services under the guise of fight against “Islamic extremism”. 1) In contrast to the stereotype formed in the 90s of Kyrgyzstan as a “oasis of democracy” in Central Asia, we see a situation with uncontrolled activity of the special services, which is very dangerous to society, especially in the Southern parts of the country. A “machinery of repression” has actually already been established here, which can come into use with full force at any moment. After the Nookat events last year, no serious grounds are needed to arrest and sentence people to 15-20 years imprisonment for “extremism”. 2) In many cases illegal actions by special service officers are not initiated by the local officers, but sanctioned from the administration of GSNB. Obviously, until this agency is headed by Murat Sutalinov, known for his extremist appeals to public persecution of independent Muslims and wide application of "common responsibility" principle in struggle against criminality (which is not compatible with the idea of constitutional state), one has no chance to enjoy the observance of norms, especially given no effective legal control over GSNB. 3) GSNB administration does it best not to allow detailed and competent reports flowing outside of the republic that cover strengthening suppression of political and religious dissent in Kyrgyzstan. This explains the fact why many human rights activists and journalists were prohibited to visit Kyrgyzstan; that is the direct contradiction to the international liabilities of the republic. 4) The repressions against independent Muslims in southern Kyrgyzstan have been intensifying since the autumn of last year – this problem is seriously underestimated by both West and local human rights community. There are no special monitoring programs on legal cases and other violations of rights of independent religious organizations. The number of prisoners, condemned on religious charges, is not reported. Only few local human rights activists involve in this problem. Just as in Uzbekistan mass media gives no information about majority of politically motivated trial procedures. 6) Our colleague Bakhrom Khamroev witnessed the night shift of GSNB officers in Osh Oblast. He observed the situation from inside unlike the invited visitors, coming in through the entrance door. Russian citizenship rescued him from torture and faked charges. What happens to ordinary citizens, suspected by local special services? Unfortunately, the opinion of condemned residents of Nookat builds ground for unambiguous and sad conclusion. 7) I would like to believe that both international organizations and state agencies of Kyrgyz Republic will pay appropriate deal of attention to the problem. * This concerns a local GSNB officer who played a agiationary role during the Nookat events in 2008, after which he was promoted and now works in Bishkek. One of those involved in the Nookat events gave Bakhrom the officer’s old work number during an interview. ** The word ”Sart” in this context is used as a deragotory name for ethnic Uzbeks. *** Alisher Saipov, famous journalist, killed in Osh in October 2007 by Uzbek security officers. **** This is a practice among GSNB officers towards Muslims. For mistakes while singing the anthem, the person is subjected to serious beatings.